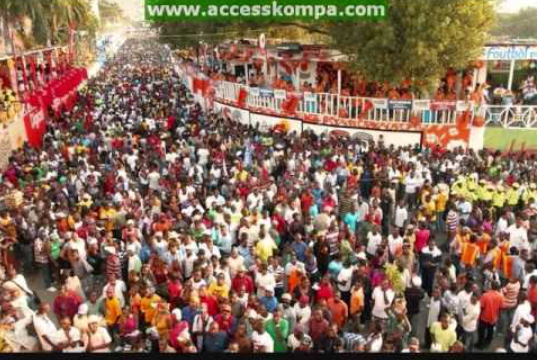 Haitian national carnival is one of the most popular in the Carribean and grandest too. No other activity has the ability to mobilize and move as many Haitian, residents national, diasporas and even foreigners, in and to our territory. For this, we are a large number to say that the carnival is provided with a great potential economic, cultural and touristic. However, each year, the organization of this party is criticized and despite occasional moments of satisfaction, in the long run the carnival is a disappointment. At the truth, today, then we have the impression that the country is making progress in several areas(tourism, for example), it is difficult to accept that public treasury funds a popular festival that we organize annually and which has potential of self- financing (failing to generate profits). Well let's not say that the carnivals do not generate profits. If it is believed official data on the last edition of the carnival flowers announcing that 85% of expenses organization of said edition were covered by the private sector, it is difficult to say that our carnivals are not profitable. The real question is not of whether the carnivals are profitable or not but rather how fringe of our population benefit them. The answer is surely not the slice of the population in poverty and extreme poverty of our cities and campaigns seeking employment, which passing is the main public of these festivities. It is really time to Haiti to do better in this area and transform what is more similar today to a guilty pleasure in a real business generating profit and jobs and therefore, carrier of economic growth. 1. The institutionalization: The following framework which it is organizing the carnival is not suitable for such size of popular activity and do not promote its expansion. To get into a new era, the carnival must become an institution of national life permanent and autonomous(likely under guardianship of the Ministry of Culture). An institution with an adequate name and the main function to organize each year editions for the carnival and support other popular festivals( holidays Country, etc.). 2. An organization that promotes popular participation: Carnival is a party for the people but the latter is put away from all the decision- making process leading to parades on the different courses. One of the best ways to organize this activity would be to adopt a selection process by popular vote as used for "Digicel Stars" . Thus, voting calls or sms would place after a first selection to at first, designate the city that host the carnival, assuming that we maintain the new practice launched by the current government. Another voting period would designate groups participating in the parade. Finally, a final series of votes would reward the best music, animation and decoration performances of the carnival. With the institutionalization, the internet usage would collect the vote of many Haitians living abroad. a. The problem of profitability: These votes which would not be free allow the Carnival to receive a first throw of funding independent of the treasury funds and the spending of tourists or diasporas, etc.. This model has proven as for some time,"Digicel Stars" which was supported in the beginning by the"Digicel company" is today its own sponsor. With the popularity which enjoy already the carnival, we can expect a craze of carnavaliers (carnivalors. Don't know if that word exists. )that would then have the opportunity to participate in the choice of groups for the parade. We speak in fact of carnavalier in a broader sense of the term because that even a person who did not have the desire and/or the possibility to go on the course of the carnivals would have its say and that includes much of the Haitian Diaspora. b. The problem of transparency at the choice of musical groups participating in the parade: The choice of musical groups participating in the parade carried out by popular vote would directly in relate the popularity of the group and/or its meringue (carnival music track) and its participation in the parade. This would confirm the status of "tenor" (best carnival band) of certain music bands. That would also give the opportunity to young musical band little known who prepares a good meringue to carve a place in the parade. c. The problem of the authority of the Organizing Committee: With the responsibility to set on time and the period of the various votes, the Organizing Committee of the carnival would have a real power to demand of musical groups to prepare their meringue and their music videos and submit them on time. d. The problems related to the relocation of Carnival: With the new practice of relocate the carnival, it has become important for economic actors and local administrative to have information that edition of the carnival will take place in their communities at least one year in advance to promote expectations and attract potential investments. A popular vote every two years for designation on the next two years cities that will welcome the carnival could remedy the organizational problems that occur by announcing for example a few months only the holding of the carnival in a particular common country. The final result of all this is a carnival institutionalized and better organized able to do pay broadcasting rights abroad and therefore, likely to project another image of the country supporting tourism, culture and trade development. It is also on a few years an institution financially solid able to contribute directly and indirectly to the tax base of the State for the economic development of the country. I can myself see a very small part of the benefit that it would lead. Can you to see the rest? See the text as published on the Nouvelliste (in french).